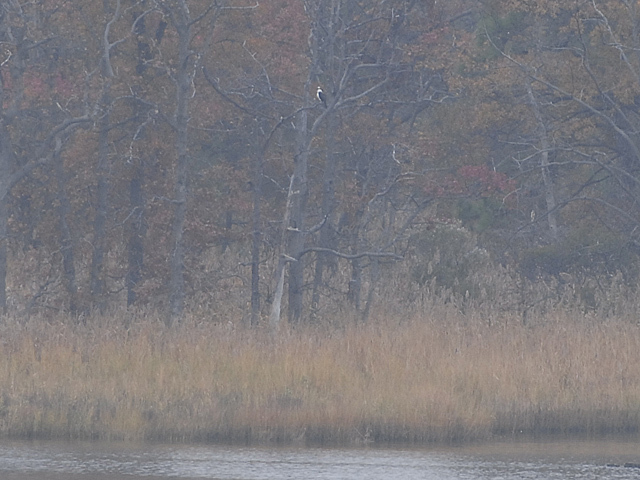 Another Osprey Sighting – Updated! 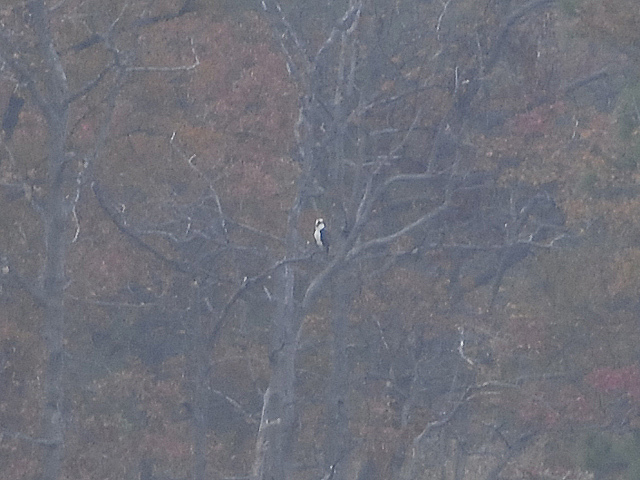 There was another osprey sighted in our area this past Sunday! I spotted this one resting about 8:30 a.m. in a tree over at CBEC. At such a distance and being perched in the shade from the rising sun, my enlarged shots are not that great but you can see him! I watched him for a half hour with binoculars when he then flew over to Marshy Creek and dove twice, being successful the second time. He then flew away in the distance with his dinner. I haven’t seen him since. I could not tell if this is the same one from my November 6th sighting, he never flew over close enough for me to get a look at his tail to see if he was missing a couple of feathers. Nor could I get a close enough look to see if it was an adult or juvenile osprey. Here are three photos. Hopefully this one gets his inner gps jump-started real soon to make it to the tropics! UPDATE! I posted the above last night. While doing my morning binocular scanning around the area about 8:00 a.m., I spotted an osprey again perched over at CBEC in a different tree. I imagine he’s probably the same osprey from Sunday. Figuring I could keep checking back on him, 15 minutes later he was gone and no where in my sight. Can’t count on nature working around our schedules! 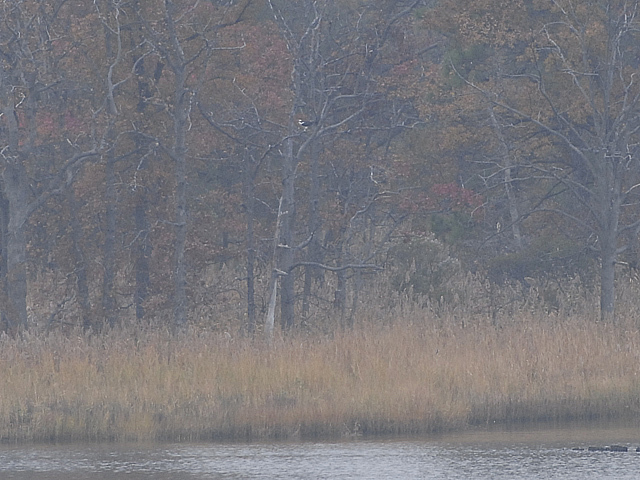 LOL Just now I checked again and there’s an eagle perched about 50-60 feet to the left of the osprey’s perch. Here’s my not-so-great photos from this morning, at least the morning’s sun brighten them! Still couldn’t make out if this is an adult or juvenile. Now if only he/she would spend some time on our osprey nest WHILE I’m here and watching….. 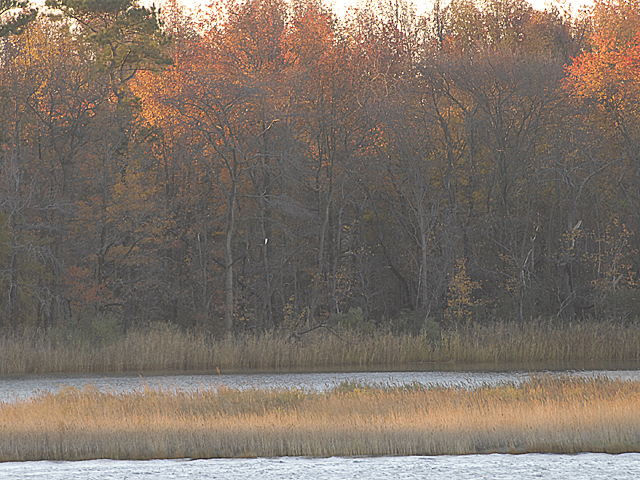 Wishful thinking though I would be in photo heaven taking shots while enjoying this late-season osprey!